“Good sushi and where to find it in KC” – that’s been my underlying motivation since I’ve moved from NYC. While there have been a few mishaps with my seafood adventures in the Midwest (note to self – do NOT use frozen supermarket lobster tails in a lobster boil), thanks to some internet research and good ole’ asking around, I’ve encountered some sushi options in the “passable to pretty good” range. 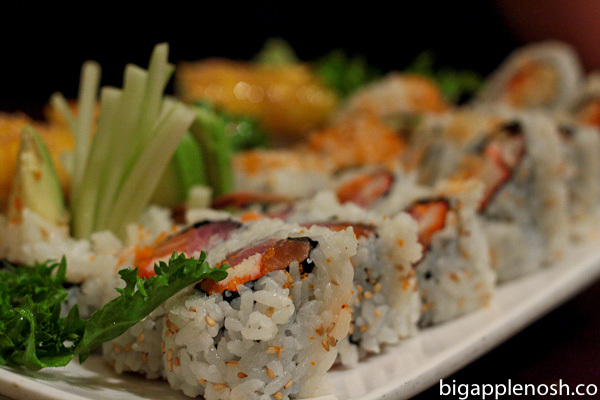 My experience at Sushi UNI fell on the “pretty good” side of the spectrum. Sushi UNI is inconspicuously located in a generic strip mall, as I’m quickly learning many good ethnic restaurants are. To me, the locale doesn’t matter – the quality of the food is paramount! So how did Sushi UNI stack up? 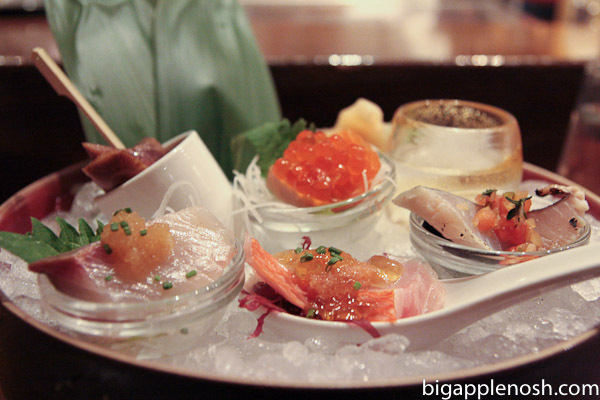 I recently checked out the Japanese restaurant BONDST with a few eating buddies. We partook in the omakase, or Chef’s selection, and sat at the sushi bar – one of my favorite seats in the house. Presented with course after course of artfully prepared cuisine, I was stuffed at the end. But how did the food measure up? Whaaaa? Half-priced sushi? NoshGirl, you so crazy. I know, jumping at a discount for raw fish sounds like a bad idea. Sometimes it is. (Note to self, never have all-you-can-eat sushi on a cruise, ever again! Let that be a lesson to you) However, I’ve been going to Zen for sushi for a few years now, and I turned out just fine and dandy. Soooo, if you’re willing to subject your stomach to some frugally-priced sushi in the name of a bargain, Zen is the place to go.